Memorial . Bedford House Cemetery Enclosure No.4 XIV. B. 36. Son of F. B. and Mary Ann Taylor Hallowes, of Dan-y-Ffynnon, Port Talbot, Glam. Pre-war Metal Broker, Battersea Park (1908). De Ruvigny's: HALLOWES, RUPERT PRICE, V.C., M.C., Lieut., 4th Battn. The Middlesex Regt., s. of Frederick Blackwood Hallowes, F.R.C.S., of Redhill, co. Surrey, by his wife Mary Ann Taylor, dau. of the Rev. William Hutchinson, Rector of Checkley, co. Stafford; b. Redhill, co. Surrey, 5 May 1881; educ. Conyngham House, Ramsgate, and Haileybury College, co. Hertford; was Sub Manager at the Mansil Tinplate Works, Port Talbot, co. Glamorgan; joined the Artists Rifles 5 Aug 1914; was gazetted 2nd Lieut. in April 1915; served with the Expeditionary Force in France and Flanders from 27 Dec. 1914, and was killed in action at Hooge 1 Oct 1915. Buried in the Brigade Cemetery, Sanctuary Wood. One of his men wrote; "Lieut. Hallowes' first thoughts were for his men; some were in a dangerous part of the trench, and he went to see if they were all right, and as soon as he reached them the shell hit him. He knew no fear and never sent a man anywhere he would not go himself. I am not certain how he won the V.C., but he earned it on several occasions. I saw him fetch in one wounded man under heavy fire, and then he went out again." 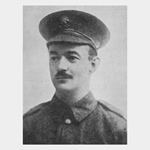 He was awarded the Victoria Cross [London Gazette, 18 Nov. 1915], "for most conspicuous bravery and devotion to duty during the fighting at Hooge between 25 Sept. and 1 Oct 1915. He displayed throughout these days the greatest bravery and untiring energy, and set a magnificent example to his men during four heavy and prolonged bombardments; on more than one occasion he climbed up on the parapet, utterly regardless of danger, in order to put fresh heart into his men. He made daring reconnaissances of the German positions from our lines. When the supply of bombs was running short, he went back under very heavy shell-fire and brought up a fresh supply. Even after mortally wounded he continued to cheer those around him , and to inspire them with fresh courage," and the Military Cross [London Gazette, 1 Jan. 1916], for gallant and conspicuous bravery in the field; unm. His last words - "Men, we can die once: if we have to die, let us die like men - like Die-Hards."